Have you heard of Brentwood Home? They are a California company that specializes in high quality mattresses, and other home products. They have been around for over 30 years and use pet beds without all those typical chemicals normally used in bedding. When a very nice man named Travis contacted me and asked if I wanted to host a giveaway for all of you for one of their orthopedic pet beds, I was excited for the opportunity. 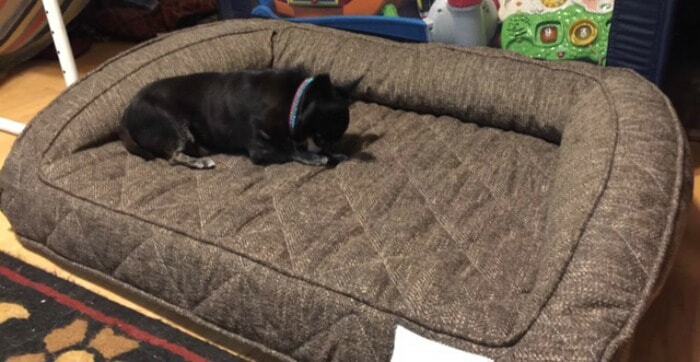 As an added bonus I got one of the pet beds for my dogs to try out too! Since my dogs are getting older, I thought this would be a great bed for them and I was right. Even though the size bed I got would be better for one of my big dogs, Kilo quickly claimed it for her own. All the dogs have tried it out though. 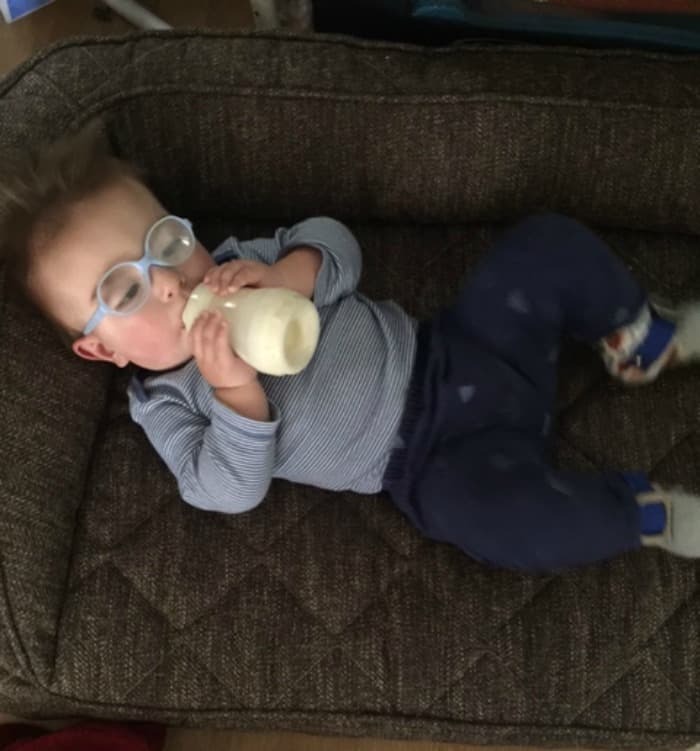 In fact, since I have it in my family room, my baby grandson loves to crawl up in it and take a nap! Guess he thinks he’s a dog too. It looks very well made. I like too that the cover is removable for washing and the lining is waterproof so the actual bed won’t get all smelly. They do have different sizes from small to extra large. The one we have and the one they are giving away is a medium. 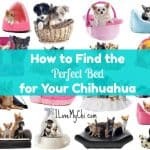 It’s plenty big enough for 2-3 chihuahuas (or more if they really like to snuggle together). You can check out all of their pet beds here. 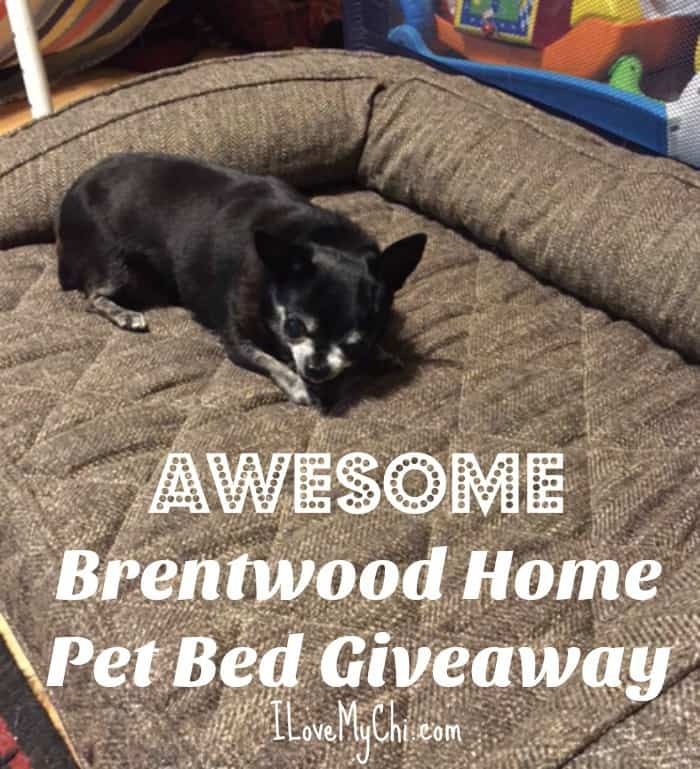 Check out the dog bed Brentwood Home is giving away is here. It has a value of $200. So would you like to win one of these beauties for your pups? Just click on the widget below, and follow the simple instructions. You may enter once a day and winner will be notified by email. The contest is over but if you would like to order this awesome bed you can use this Brentwood Home Coupon OURHOME to get 10% off your order. You can order it here. 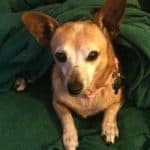 I have two rescue dogs – Milo and Monty. 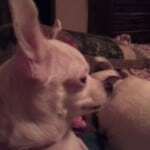 Milo is a Minpin with Chihuahua in him and Monty is a Dachshund with what looks like maybe a Pit Bull (I kid you not!) and some other things. Both were pulled from the local high-kill shelter. 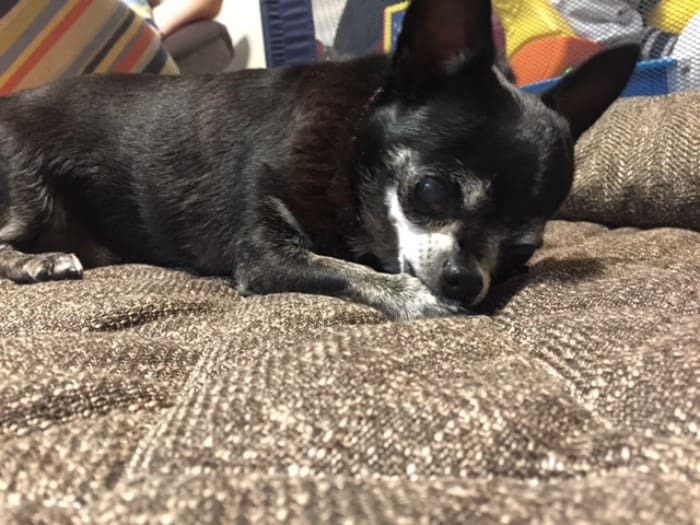 Monty is about 15 years old and someone just discarded him like trash. He’s so sweet, not an ounce of aggression in him. 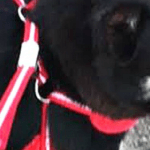 Milo spent months at the shelter; he was evidence in an animal abuse case. We have no idea what people did to him but he did need an operation from having been kicked. Now he’s my love rocket and he wants to catch balls all day long.They both need a second bed so that they can lay together by my desk. This bed would be perfect for them then Margot. Thank you for giving these 2 sweet babies the kind of home they deserve! Commenting again today, Monty and Milo are my two darlings – spoiled, spoiled, spoiled now. Jake the malamute will love this bed. 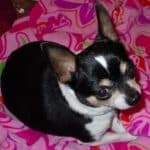 My sweet chi, Taffy is a rescue. At one and a half years old, she only weighed 2 lbs, and you could see all her ribs. One of her sisters was found dead, and the others were in bad shape. Today she is still a bit afraid of strangers, but has put on weight and is healthy as can be, and she can always be found snuggled next to me in my chair. Taffy is so pretty Nancy! Back visiting your blog again today. Here’s Jaunty Monty in his neck scarf (alas, the neck scarf had to be discarded after a skunk incident! My girls keira (left) & storm (right) would share the bed! Wow, those two toned eyes are so cool! **update** I have been trying on every browser to add this cute photo and to comment, but I just get a 505 error. So, just rust me – he’s dern cute! Yeah my sites were all down but they are back up now and should be working okay (hopefully). Hi again, I feel so bad about multiple posting on your site! My guys a had a fun election night hogging the sofa and barking like maniacs. Don’t feel bad Margot. It gives you more chances to win! My baby Sadie would love this bed! These are the stinkers and they stink. Skunk attack! 6 baths each with special recipe of Dawn Dishwashing Liquid, Baking Soda and peroxide and they still stink a little. I love them, but they are complete idiots. I noticed that the cats have the sense not to get themselves skunked, but these bone-heads go right for the skunk barking and raising cain. Oh no! Did you try tomato juice? I got them as clean as I can, this is not the first time. I just have to really police the feral cat food station and make sure there is no food out after dark and (sooner or later!) the skunk will move on. I would never do anything to harm the skunk or get trappers after it. We live right at the foot of some mountains and there were fires there, so lots of wildlife is running around the streets (even coyotes) that will eventually go back to the mountain if we don’t entice them with food. Monty & Milo, my happy boys, never had it so good but they could go for a new comfy bed that is big enough for them to be on together. they are bonded now. 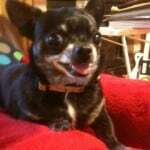 All the dogs sound like deserving winners, not just mine – so good good luck to everyone and :;woof! :: Here’s Milo with one of his many Kong balls. he never lets Monty have even one. Hi again, here’s milo and his decimated monkey toy! Jake is our malamute who will be using the bed. So glad you like it Margot. We love ours. My grandkids love it as much as my dogs do. I wish I could afford another one.